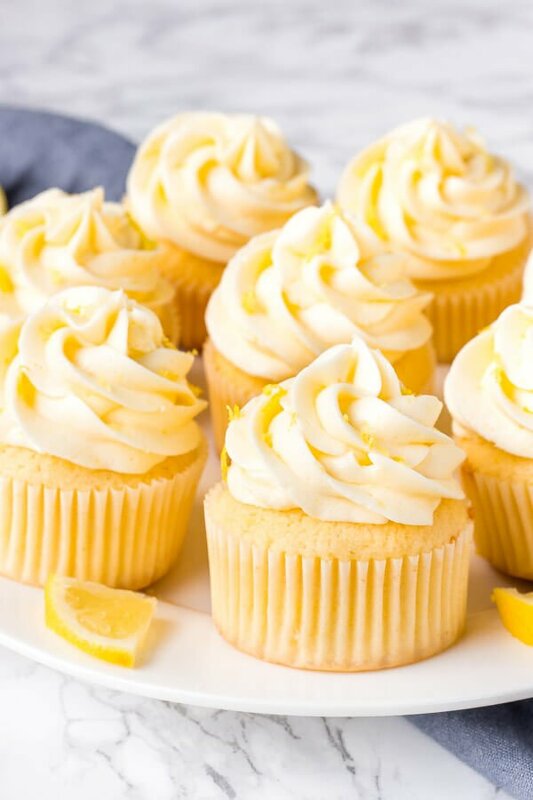 These homemade lemon cupcakes are fluffy, moist and topped with lemon buttercream frosting. The citrus flavor is the perfect balance of sweet and tangy, and perfect for true lemon lovers. 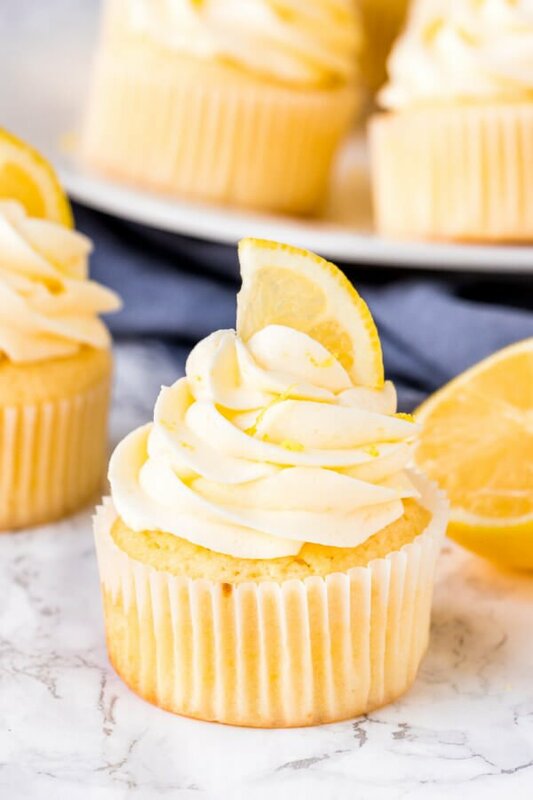 These lemon cupcakes with lemon frosting definitely aren’t complicated – but oh my, are they ever delicious. The lemon flavor is sweet, tangy, tastes like sunshine, and screams springtime. The cupcake crumb is moist, fluffy, and perfectly soft. And to top it all off (literally and figuratively) – they’re frosted with lemon frosting. 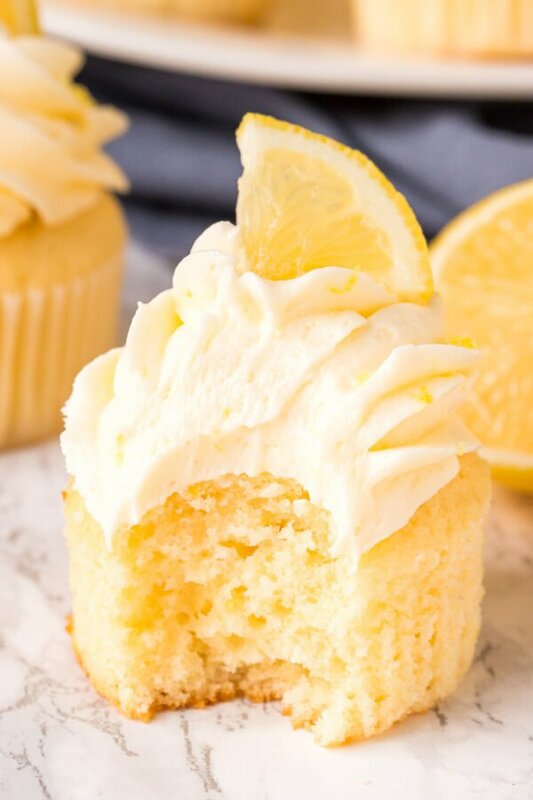 This lemon cupcake recipe is based on a simple vanilla cupcake recipe, only we’re adding both lemon zest and lemon juice to get the perfect flavor. Like most cupcake recipes, we start off by creaming together the butter and sugar (plus lemon zest for this recipe). Then mix in the eggs 1 at a time. We alternate between mixing in additions of the dry ingredients (flour, baking powder & salt) and the wet ingredients (milk, sour cream & lemon juice). Ingredients should be room temperature before getting started. Take them out of the fridge 30 minutes prior. Or you can warm up them up in the microwave in short bursts (just not the eggs). Zest the lemons before squeezing the juice – this makes the process much easier. Make sure to beat the butter and sugar until fluffy – this will take about 2-4 minutes and is called “creaming”. Creaming the butter and sugar makes cupcakes lighter and fluffier because it adds air to the batter. We whisk together the flour, baking powder and salt before adding them to the batter. Whisking them together first ensures that the baking powder is evenly distributed in the batter so that the cupcakes rise beautifully. We’re using both sour cream and milk for moisture. Sour cream makes cakes and cupcakes that are extra moist, but the addition of milk too ensures that they don’t get too heavy and weighed down. Mix in about 1/3 of the dry ingredients, followed by about 1/3 of the wet ingredients (you’ll whisk them together first). Doing this in stages helps the cupcake batter become even and consistent. This ensures that the cupcakes have a soft crumb without air tunnels or a lumpy consistency. Bake 1 tray of cupcakes at a time on the middle rack of the oven. Baking on a top rack can burn the tops, whereas baking on the bottom rack and burn the bottoms of the cupcakes. 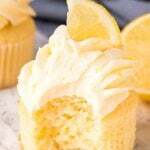 Then once the cupcakes are baked – they’re frosted with lemon buttercream. 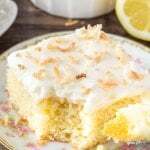 Simple, creamy lemon frosting – made with lemon juice and lemon zest for the perfect lemon flavor. You can play around the amount of lemon zest and juice depending on how tangy you like the flavor. I definitely prefer a pretty pronounced lemon flavor, so the feel free to adjust as necessry. 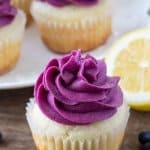 Want lemon blueberry cupcakes? 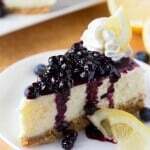 Use the recipe below, and gently fold in 3/4 cup blueberries at before spooning the batter into your cupcake pan. The bake time will be similar. Want lemon raspberry cupcakes? Try this recipe instead. In a large bowl using an electric mixer, beat the butter, sugar and lemon zest until fluffy (about 2-3 minutes). Beat in the eggs 1 at a time and vanilla extract. In a liquid measuring cup whisk together the sour cream, milk and lemon juice. Beat about 1/3 of the flour mixture into the butter mixture, followed by about 1/3 of the sour cream mixture. Turn off the mixer and scrape down the sides of the bowl as necessary. Repeat the process until all the flour and all the sour cream mixture is incorporated. Spoon the batter into the prepared muffin pan, filling each liner about 3/4 full. You should end up with about 12-14 cupcakes total. Bake on the middle rack of your oven for 16-19 minutes, or until an inserted toothpick comes out clean. In a large bowl beat the butter until fluffy (about 3-4 minutes). Add in the lemon zest and salt. Beat in the rest of the powdered sugar about 1/2 cup at a time, alternating with 1 tablespoon of fresh lemon juice until the desired consistency and sweetness/tartness level is reached. Frost the cupcakes with a knife, or transfer the frosting to a piping bag and frost. You will need about 2 medium lemons for the cupcakes and frosting combined. Store leftovers in an airtight container at room temperature for 1 day, or in the fridge for up to 3 days. Make Ahead Tips: Cupcakes are best if enjoyed the same day that you make them. Cupcakes can be made 1 day in advance and stored in an airtight container. Frost the day that you plan to eat them. Unfrosted cupcakes can be frozen, then thawed in the fridge. Bring them to room temperature before frosting.